JU students help unload food items for distribution to Arlington residents at Town and Country shopping center after Hurricane Irma's destruction. 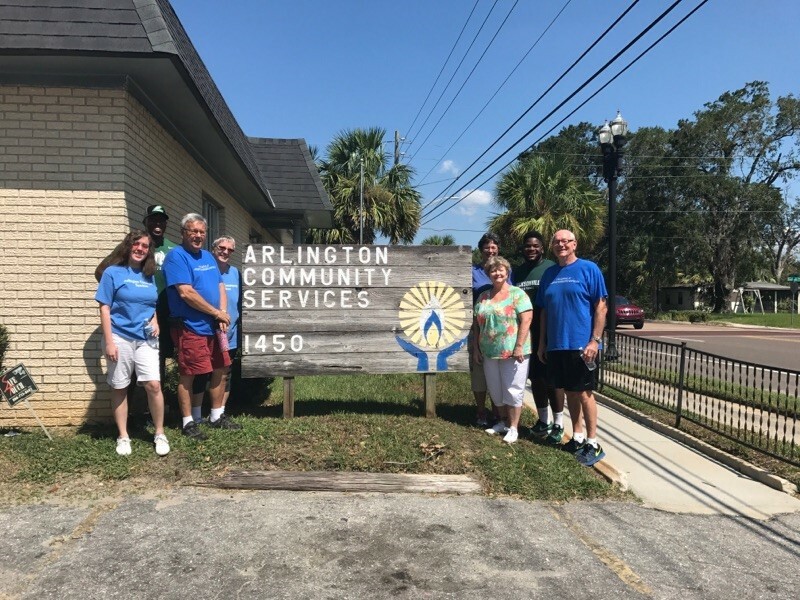 Most people wouldn’t stare Hurricane Irma’s wake of destruction in the face and see it as an opportunity, but that’s just how the Jacksonville University family saw it: a chance to give back to the Arlington community and accentuate common ground among all the area’s residents. 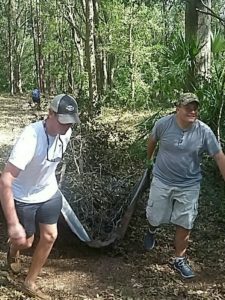 Sigma Chi fraternity members help clean up at the North Florida School for Special Education in Arlington after Hurricane Irma. Students, alumni, faculty and staff fanned out across the region with volunteerism on their minds and giving in their hearts after Irma’s fierce Sept. 10-11 storm surge, high winds and torrential rainfall. “As a University community, our thoughts and prayers are with those whose homes and businesses felt the full effect of this devastating storm,” President Tim Cost said in his message titled “The JU Spirit” to the campus community. JU Softball players assisted a Clay County homeowner with cleanup after their home took on nearly four feet of standing water. 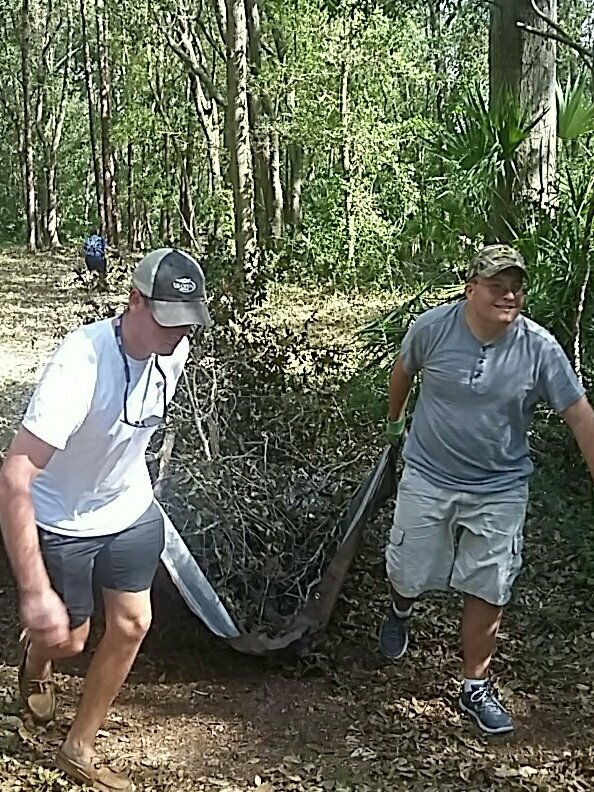 Fifteen JU Sigma Chi fraternity members helped in campus cleanup at the North Florida School for Special Education. 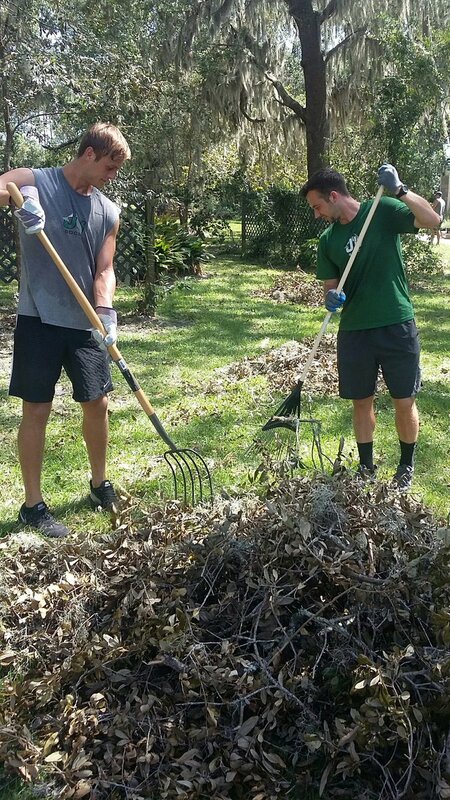 JU Men’s Soccer players did cleanup at L’Arche Jacksonville, a housing center for individuals with intellectual and physical disabilities. 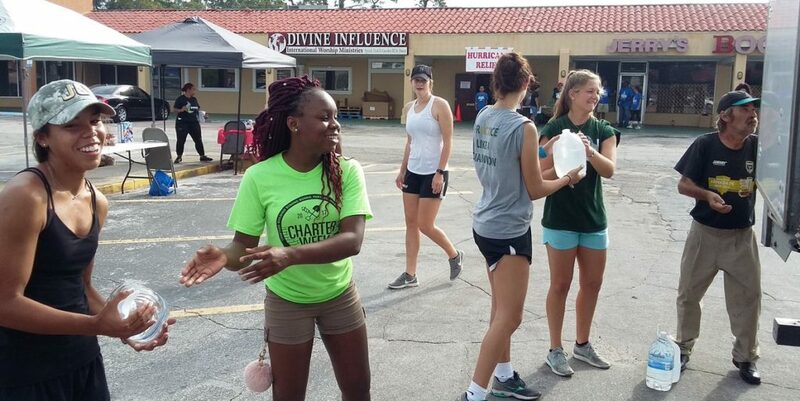 Before, during and after its Friday night Women’s Soccer game and Saturday Football home opener, JU Athletics collected more than 500 pounds of food items for donation to Arlington Community Services, a branch of Feeding Northeast Florida, with JU Football players making the donation. 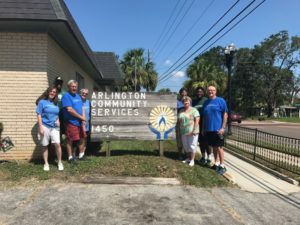 Thirty JU student volunteers partnered with Jacksonville City Councilwoman Joyce Morgan, Arlington 2020 and other community groups to prepare and distribute disaster relief goods to Arlington residents. JU Athletics collected and delivered more than 500 pounds of food to Arlington Community Services after the storm. 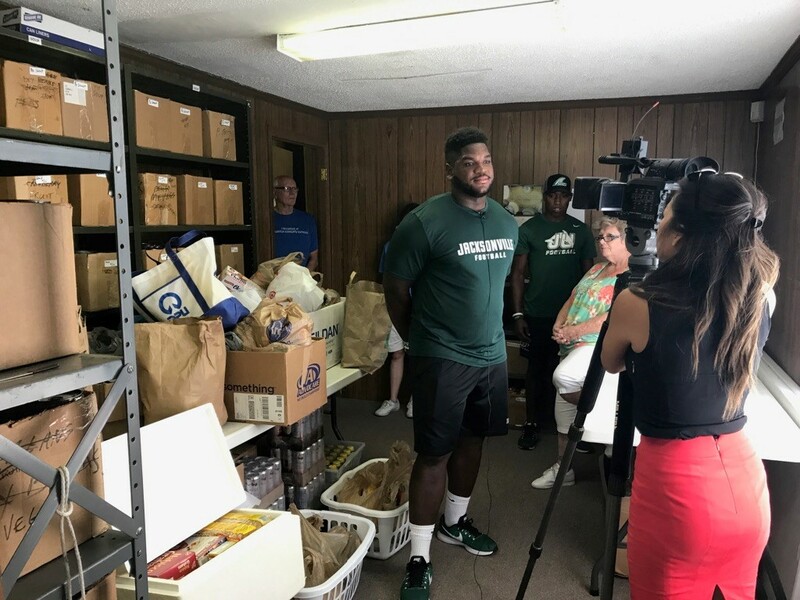 WJXT TV-4’s Crystal Chen interviewed JU football players after Athletics collected and delivered food items for Arlington Community Services, a branch of Feeding Northeast Florida. JU defensive back Emon Smith, who helped deliver food items to Arlington Community Services, told WJXT TV-4 that the devastation hit home because he has family members who lost everything during hurricanes Katrina and Irma. “Well my grandma lost her house, my other grandma also lost her house, so I felt for the people because we lost a lot of things,” he said. Deborah Woods, executive director of Arlington Community Services, called it a “no-brainer” to accept JU’s offer of a food donation. 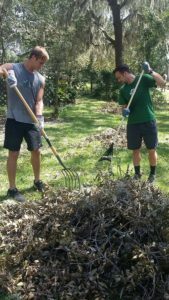 Men’s Soccer players help rake up debris at L’Arche Jacksonville after Irma. Quoc Mai, a member of Christ the King Catholic Church on Arlington Road, sent a special thank-you note to the University after getting unsolicited aid from Men’s Soccer players and coaches while he tried to clean up around the property. Soccer Head Coach Mauricio Ruiz said the coaching team instills values about community and responsibility in its players daily.